As the seasons change, so do our food cravings. We know that summertime provides a great variety of fresh fruits and vegetables here in Maine, but that isn’t always the case in the long winter season. We like to call winter “soup season,” as we crave warm, comforting meals – like soup – to stave off colder temperatures. Keep reading for some great soup recipes that are nutrient-dense (lots of nutrition in fewer calories), budget-friendly, and perfect for warming up these chilly days! Try this Cheesy Potato Soup recipe! This recipe makes enough to feed six people, so share with your family, friends, or freeze some for a night you don’t feel like cooking! 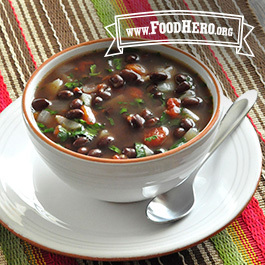 This Black Bean Mexican Soup has a little kick and is simple to make! Using canned beans makes it quick and easy, and canned tomatoes are a great way to save money when fresh tomatoes are not in season. Try this Curried Pumpkin Soup Recipe! It has a great blend of spicy and sweet. Make this soup in just a few easy steps. Five ingredients and five minutes is al you need to create this delicious Skillet Corn Chowder! Using 1% milk in the recipe helps cut down on the fat content, which is often the downfall of other pre-made chowders. This West African Peanut Soup recipe is delicious! Between the peanut butter and chicken, the soup is packed with protein. For more delicious soup recipes like those above, visit www.mainesnap-ed.org or follow this link: https://www.mainesnap-ed.org/recipe/?meal=5#recipe-selection. Don’t like an ingredient in one of the recipes? Try swapping it out with something you like. Also, try adding different vegetables or beans to soups for a healthy boost.